Confession: I’ve been spending a lot of time on Pinterest these days. One glance at Pinterest and you’ll likely want to try eight recipes for Quinoa, find an irresistible way to decorate your front door, and try a new work out in order to look good in that new outfit Keira Knightley is wearing. And yes, you’ll probably leave feeling hungry. But Pinterest is more than a time-sucking, eye-candy pinning and daydreaming organizational tool. With 28 million visitors a month, it’s one of the fastest growing websites in the world, it’s supposed to account for 40% of all social media-driven purchases, and it’s a boon for writers. 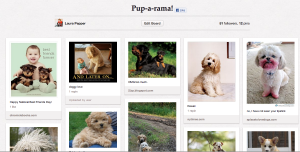 Quick 101: What is Pinterest? When you see something fab on the internet, a handy little feature allows you to click on it to save the website/image to the board of your choosing. No more bookmarking! Along the same lines, when you begin following your friends on Pinterest, you can re-pin their pins to your own board and vise versa. See how this can be addictive? Like other social networking sites, Pinterest serves as an excellent platform to promote your work in a different way as you can build (and showcase) your brand through your boards. 1. Showcase Your Work. Create a board dedicated to your book achievements. Pin book covers, reviews, fan letters, blog tour stops, etc in one place. 2. Paint a picture. Start a board dedicated to the setting of your book. Display photographs of the city, famous residents, landmarks, etc. Not only will you be engaging your readers, you’ll likely gain new ones by pinning similar interests! 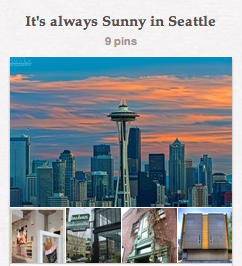 It’s Always Sunny in Seattle is a board to inspire me for the setting of my latest book. Your fans and friends will share, therefore expanding your reach. 4. Field Research. Thinking about writing a historical fiction novel taking place during World War II? Use Pinterest to organize your data and photos. Describing a character that bakes? Find delicious cake recipes and photos in order to help expand your descriptions beyond cheesecake. 5. Show a Little Love. The “Books Worth Reading” comes already listed as one of your boards when you sign up for Pinterest. You don’t have to use it, of course, but showing your fellow authors a little love is an excellent way to pay it forward. 6. Build your Brand. You are a brand and you can build it right there on Pinterest. From the recipes you pin to the someeCards you like, the more people get to know you (and relate to you), the more readers you’ll gain. Stay engaged. Don’t just pin a bunch of stuff and be done with it. Like other people’s pins, re-pin and comment. Use large, interesting photos. Pinterest is eye-candy to a “t” so use great images to capture attention. Time for Cake is a collection of cakes that I describe in my own (yet to be published) book, Poppy. Include Pinterest’s “P” symbol on your website so you readers can pin your work (like to their “Books Worth Reading”) and know they can follow you. Host some pictures of your own on your author website. That way you’ll benefit from the backlinks from Pinterest to your site, great for attracting traffic as well as improving the SEO of your site. See yesterday’s post for how to create great infographics for free. Use hashtags much as you would on Twitter to improve the chances of your pins being found during searches. For example #writers #fiction #romance #YAlit and so on. – Tarryn Fisher is casting characters for her book The Opportunist. – Here’s my board on Indie Authors Doing it Right featuring my favorite self-published authors. – Chronicle Books have a great collection of boards relating to the books they publish. What are your favorite boards? Leave a link to your Pinterest account so we can find you over there.